Have you ever asked yourself why everything needs to be rounded or spiky? As diverse as the universe of piercings appears as diverse the possibilities of shapes should be. For that reason we included numerous crazy shapes that might give you the X factor. Our selection includes spiders, stars, basketballs, dragons, ornaments, Chinese signs, flowers, hearts and many more. No earlobe stretching is needed to rock your world and help you get these looks of envy. Fake plugs in crazy shapes offer a whole new world of piercing jewelry. This way you can wear fake plugs the world hasn't seen before. There are hundreds of different shapes that fake plugs can be made in. With each of these your earlobe piercing jewelry will be a true eye catcher. To make the decision a bit easier we would like to make some suggestions about what kind of form plugs might be cool and which are our current bestsellers. The most popular one is the fake plug in the shape of a star. It is made of premium quality 316 L surgical steel and a big crystal is placed in the center. At least as popular are the limpid fake plugs in the shape of a crucifix. These are very beautiful and a black gemstone is places in the center of the cross. Almost as popular are fake tunnels in the shape of a zipper. These are available in black, gold and silver and they look like real zippers. 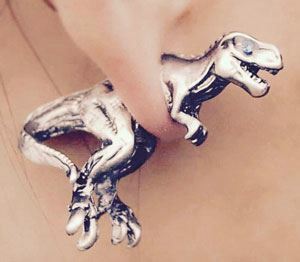 They are a really funny and stylish accessoiry for piercing fans who don't take themselves so seriously. Many girls enjoy flowers. So as a man it is always a good idea to bring her some. But there is no need to bring plants all the time. Why not going the different way and bring cheater ear plugs in the shape of a rose, a tulip or a hyacinth this time. These are very beautiful and girls can wear them with traditional earlobe piercings like you would need it for classical earrings or ear studs. A stretched earlobe piercing is not needed to wear them. Also very beloved at the moment are Chinese characters and Chinese dragons. Theses are available in various different colours as well. Apart from the form cheater ear plugs that have been already mentioned there are also numerous different other ones like musical instruments, hands, skulls, spiders, dinosaurs and many more. Just select your favourite one and be happy with your new unique form fake plugs.